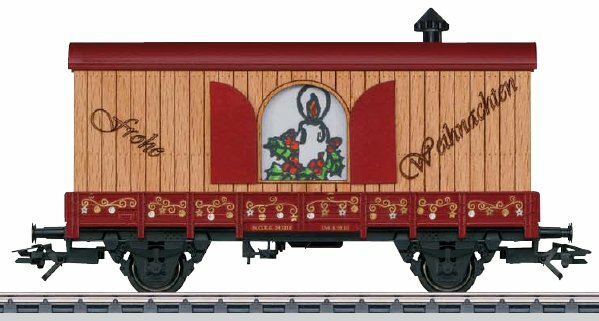 42610 "Blauer Enzian" / "Blue Gentian" "F-Zug" Express Train Passenger Car Set. Prototype: Class 185.2 general-purpose locomotive in a fantasy HARIBO paint scheme. Built by Bombardier as regular production locomotive from the TRAXX program of motive power. Dual system locomotive. Model: The locomotive is constructed of metal with many cast-on details. The locomotive has a digital decoder and a special motor. 4 axles powered through cardan shafts. Traction tires. The triple headlights change over with the direction of travel, will work in conventional operation, and can be controlled digitally. The headlights are maintenance-free LEDs. 2 pantographs that can be raised and lowered (they are not wired to take power from catenary). A filled tin is included. Length over the buffers 21.7 cm / 8-1/2". A tin filled with 2 packages of different HARIBO products is included as an extra treat. only for members of the 1. FC Märklin and Insider members. Prototype: Mitsui Rail Capital Europe B.V (MRCE) class EuroRunner ER 20 diesel electric general-purpose locomotive. Model: The locomotive is constructed of metal with many cast-on details. The total design of the locomotive is ideal for model railroad operation. The locomotive has a digital decoder and a special motor. 4 axles powered through cardan shafts. Traction tires. The triple headlights change over with the direction of travel, will work in conventional operation, and can be controlled digitally. The headlights are maintenance-free LEDs. Length over the buffers 21.7 cm / 8-1/2". Prototype: German Railroad Inc. (DB AG) class 120.1 general-purpose locomotive. Promotional paint scheme "175 Jahre Eisenbahn in Deutschland" / "175 Years of Railroading in Germany". Model: The locomotive has an mfx digital decoder and comes from the factory with sound functions that can be turned on and off. It also has controlled high-efficiency propulsion. 2 axles powered. Traction tires. The headlights are maintenance-free, warm white LEDs. They will work in conventional operation and can be controlled digitally. The engineer's cab lighting can also be controlled digitally. The locomotive has separately applied grab irons. Length over the buffers 22.1 cm / 8-11/16". Promotional locomotive for the great anniversary "175 Jahre Eisenbahn in Deutschland" / "175 Years of Railroading in Germany". Digital sound: warning horn and station announcements. 37659 - "Karlsruhe Train" S-Bahn Prototype. Prototype: Austrian Federal Railways (ÖBB) class 2070 "Hector" general-purpose locomotive. Vossloh Schienenfahrzeugtechnik GmbH (VSFT) diesel hydraulic model G 800 BB, developed from former MaK standard design locomotives. Model: The locomotive comes with a digital decoder and controlled high-efficiency propulsion. 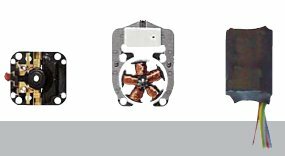 Centrally mounted, powerful can motor with a bell-shaped armature and a flywheel. 4 axles powered. 4 traction tires. The lighting is maintenance-free LED's. The headlights / marker lights will work in conventional operation and can be controlled digitally. 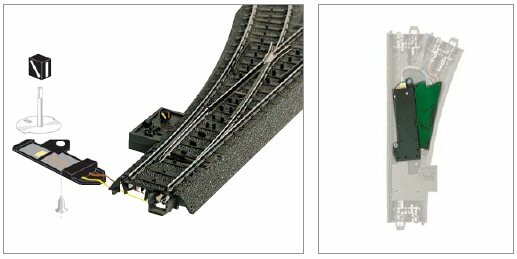 The acceleration and braking delay can be controlled digitally with a 6021 Control Unit Märklin Systems. Metal handrails on the sides and ends. Length over the buffers 16.5 cm / 6-1/2". Prototype: German Federal Railroad (DB) class V 200.0 heavy diesel hydraulic locomotive. General-purpose locomotive in the classic crimson paint scheme with the striking lettering "Deutsche Bundesbahn". The locomotive looks as it did around 1958. Model: The locomotive has an mfx digital decoder and extensive sound functions. It also has controlled Softdrive Sine high-efficiency propulsion and a compact design, maintenance-free motor. 2 axles powered. Traction tires. The triple headlights and dual red marker lights will work in conventional operation and can be controlled digitally. The separately applied side and end grab irons are made of metal. The couplers can be replaced with close end skirting pieces. Length over the buffers 21.0 cm / 8-1/4". Compact design, Softdrive Sine high-efficiency propulsion. Prototypical train composition for the "Blauer Enzian", with the 42610 express train passenger car set. The class V 200.0 is the ideal locomotive for the classic "Blauer Enzian" / "Blue Gentian" express train, which can be made up with the 42610 express train passenger car set. This model can be found in a DC version in the Trix H0 assortment under item no. 22373. 42610 - "Blauer Enzian" / "Blue Gentian" "F-Zug" Express Train Passenger Car Set. Prototype: 5 different German Federal Railroad (DB). 1 type WRPw4üe end car with a baggage area, machinery room, galley, and dining area, 3 type A4üe intermediate cars, 1st class, 1 type A4üe end car, 1st class, with an observation area. The cars are steel blue in color. Used for the "Blauer Enzian" / "Blue Gentian" "F-Zug" express train. Rebuilt cars from the former Henschel-Wegmann train. Used on the train route Munich - Augsburg -Würzburg - Bebra - Hannover - Hamburg Altona. The cars look as they did around 1958. Model: The minimum radius for operation is 360 mm / 14-3/16". The interiors vary according to the car type. The cars have prototypical changes in the roof area. The end cars have prototypical round buffers instead of the former buffer stumps. All of the cars have factory-installed interior lighting. The interior lighting is done with warm white LEDs. One car comes from the factory equipped with a pickup shoe. Current-conducting coupling drawbars come from the factory already mounted in standard coupler pockets for providing power to all of the cars in the train. The cars have train destination signs and car sequence numbers printed on them.Total length over the buffers 126.5 cm / 49-13/16". DC wheel set per car 4 x 700580. Prototypical changes to the cars. A correct "Blauer Enzian" train is possible with the 39804 diesel locomotive. The classic "Blauer Enzian" / "Blue Gentian" express train can be reproduced prototypically with the 42610 express train passenger car set and the 39804 diesel locomotive. This car set can be found in a DC version in the Trix H0 assortment under item no. 23373. "Blauer Enzian" / "Blue Gentian" F-Zug Long Distance Express The "Blaue Enzian" stood for a type of mystique during the German Economic Miracle period. The precursors to the West German economic miracle made themselves known quite soon after the founding of the German Federal Railroad (DB). And, the DB management recognized early on that the senior managers for the economy would need a reliable transportation network. The worst of the damage from World War II had hardly been cleared, and the railroad prepared a train network as early as 1951 that was planned to connect the important West German urban centers by means of fast trains. The so-called "F-Zug" network had its roots in the express powered rail car network of the pre-war period, but it had an important difference: While the German State Railroad Company (DRG) before World War II had oriented the network of "Flying Trains" to Berlin, the main routes of the F-Zug network in the postwar period ran from North to South due to the "Iron Curtain". Fast train connections were set up between Hamburg, Bremen, the Rhine-Ruhr area and Cologne, Frankfurt (Main), Stuttgart, Nürnberg, Munich, and Basle, trains which ran with just a few stops out in the morning and back in the evening. The idea was that it should be possible to do an outside business appointment in one day. Of course, this did not work for great distances such as Hamburg - Munich. Borrowing from the "FD" in use before the war, the train class was now called "F-Züge", where the "F" stood for "Long Distance". An "F" surcharge had to be paid in addition to the regular ticket price. The train routes were given euphonious names starting in 1953: The train pair F 55/56 (Hamburg – Munich – Hamburg) was the first and was given the name "Blauer Enzian". With "Gambrinus", "Helvetia", "Senator", "Roland", and "Domspatz" – to mention just a few – the "F-Züge" or "Long Distance Trains" bore additional melodious names and became the pride of the new German Federal Railroad. The name "Blauer Enzian" did not have its roots in the famous song of a German hit singer; that came much later. The "Blauer Enzian" was more the result of a contest organized among the passengers, who voted for the alpine flower. It's possible that the passengers associated the paint scheme and the train's destination near the Alps with the rare bright, pure blue color of the flower. The "Blaue Enzian" was an exception among the "F" trains due to its cars, because from December of 1953 on it was upgraded through the use of the car set for the former Henschel-Wegmann train. The Henschel-Wegmann train ran between Berlin and Dresden before World War II starting with the summer schedule of 1936. It served the barely 180 kilometer / 113 mile route with two pairs of trains daily. The fastest run for this distance required 1 hour and 35 minutes. This made the Henschel-Wegmann train a good half hour faster than all of the previous trains. Even today there is no comparable offering by far; the fastest connection between Berlin and Dresden adds up to a good two hours and 15 minutes. In 1946, this set of cars was standing totally plundered and no longer usable in Hamburg- Langenfelde. In 1952, the DB had it brought back to the builder, Wegmann, in Cassel, where the five cars were completely overhauled, updated, and painted in the blue of the "F" trains. The design of the cars remained largely unchanged. The trucks however were equipped with a fourth spring and the basic plan as well as the interior features was adapted to the new requirements of the "F" train service. The train offered an elegant view in its steel blue and silver paint scheme with black skirting. After the DB had presented this rebuilt train to the public at the German Transportation Exhibition in Munich from June to November of 1953, it was in service for 5 years starting in December of 1953 as long distance train F 55/56 "Blauer Enzian" between Hamburg and Munich with intermediate stops in Hannover, Göttingen, Fulda, Würzburg, Treuchtlingen, and Augsburg. Starting at the end of 1956 / beginning of 1957 the steam motive power in use until then north of Würzburg gave way to diesel power with the new class V 200.0. South of Würzburg older class E 17 and E 18 electric locomotives were used until the new class E 10 electrics entered service. In 1959, the German Federal Railroad took the Henschel-Wegmann train out of service and stored it at the maintenance facility in Neuaubing. It was scrapped there in 1962 after it was finally retired. Prototype: 2 German Railroad, Inc. (DB AG) type Sgns 691 four-axle flat cars for containers. Traffic red basic paint scheme. Each car loaded with 3 type XXL WoodTainer containers lettered for the Austrian firm Innofreight, A-8600 Bruck an der Mur, Austria. Large volume containers with a capacity of 46 cubic meters / 1,625 cubic feet. The cars look as they did around 2009. 1 type 966G Cat wheel-mounted front end loader. Model: The cars have type Y 25 trucks. The floors for the flat cars are prototypically partially open and are constructed of metal with striking fish belly design side sills. Each car comes loaded with 3 removable containers. The two flat cars have different car numbers. All of containers have different container numbers. Length over the buffers 45.6 cm / 17-15/16". DC wheel set per car 4 x 700580. The type XXL large volume WoodTainer is new tooling. Cars ideal for unit trains. Prototype: Type Sgnss four-axle flat car for containers. Loaded with 3 type XXL WoodTainers painted and lettered for the firm Innofreight Speditions GmbH. One of the WoodTainers is painted and lettered for Märklin. Model: The car has type Y 25 trucks. The prototypical partially open car floor is constructed of metal. The type XXL WoodTainer are removable and have different registration numbers. Length over the buffers 22.7 cm / 8-15/16". DC wheel set 4 x 700580. WoodTainer in authentically painted and lettered for Märklin. .
Prototype: Type Kklm 505 low side car. Fantasy design for Christmas. Model: This low side car comes loaded with an Advent calendar module with a window on the two sides of the car. One of 24 Christmas themes can be seen in the window, and these themes can be changed by turning a plastic knob. The car has close couplers with a guide mechanism. Length over the buffers 11.5 cm / 4-1/2". DC wheel set 2 x 700580. An appealing Advent calendar module. An attractive addition to the Christmas car series. One-time series only for 2010. Digital turnout mechanism set with a turnout lantern for installation in a left or right C Track turnout, item nos. 24611, 24612, 24711, 24712, 24671, or 24672. The set consists of a turnout mechanism, turnout decoder, turnout lantern, and installation instructions. This set is not designed for use with the 24630 three-way turnout. Prototype: Refrigerator car with a brakeman's cab, older design. Model: This car is an old-timer with a Christmas design. Length over the buffers 40 mm / 1-9/16". One-time series only in 2010. The Christmas car for 2010 comes in a clear plastic rocking horse. The latter can be hung on a Christmas tree with a cord included in the package and continues the series of festive themes from previous years. Prototype: Type ML 2200 C´C´ diesel hydraulic experimental locomotive from Krauss-Maffei. Prototype in the factory paint scheme of 1957. Model: Both trucks powered. The locomotive has triple headlights and dual red marker lights that change over with the direction of travel. The lights are maintenance-free warm white and red LEDs. Length over the buffers approximately 92 mm / 3-5/8". Maintenance-free LEDs for headlights and marker lights. Prototype: German Railroad Inc. (DB AG) class 120.1 fast general-purpose locomotive in a promotional paint scheme "175 Jahre Eisenbahn in Deutschland" / "175 Years of Railroading in Germany". Promotional locomotive for the great railroad anniversary. The 88480 electric locomotive is being produced in 2010 in a one-time series only for Insider members.